Hi everyone, I am so excited for 2018 Resolutions week. 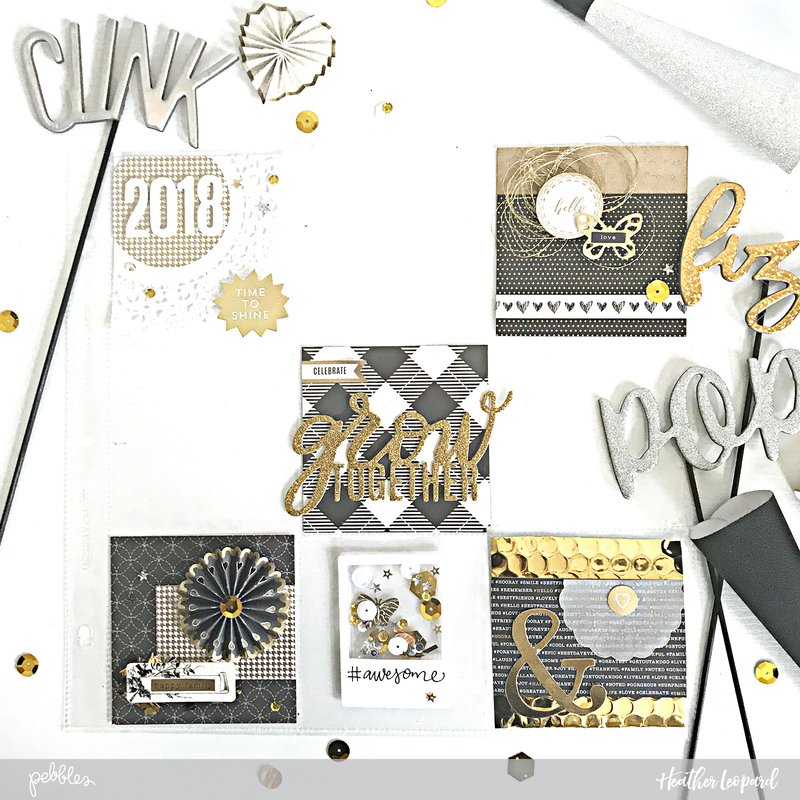 I thought it'd be fun to create a pocket page that will coordinate with a New Year's Eve page you'll see here on the blog next week. This pocket page will store our resolutions notes for 2018 that we'll write on NYE, hence the empty spots. 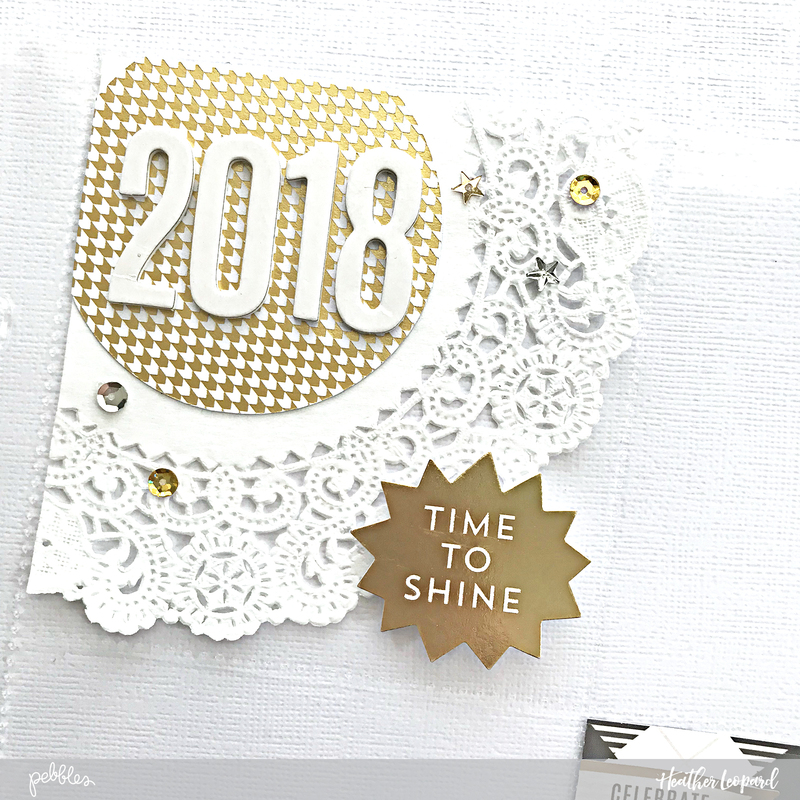 I was originally going to add "hello" to 2018 but I didn't like the composition so I moved it to the next card, which was created using two patterned papers. Then, I added some thread and a butterfly embellishment. 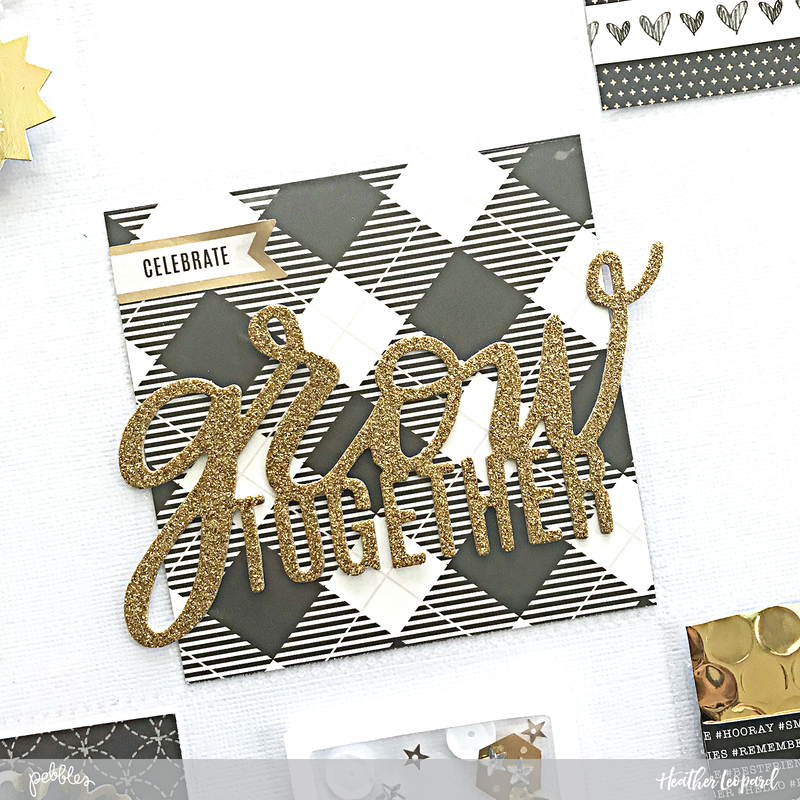 Since this is an opening spread to my family's new year, the "Grow Together" sentiment was perfect. I created a sequin pocket for this cute little frame. I added some sequins to a small jewelry bag, placing a few in the bag using glue dots so they didn't all fall down to the bottom. Using my fuse tool, I made the bag to the right size of the paper frame. More tips on this can be found on my Instagram (@heatherleopard). I included an ampersand on the last pocket to show that our 2018 story will continue throughout the pages of the album. I was even able to align it so that the bubble wrap dots create a "..." after the ampersand. So that's how I created my resolutions page to kick off my 2018 album. Hi everyone. Thanks for stopping by today. 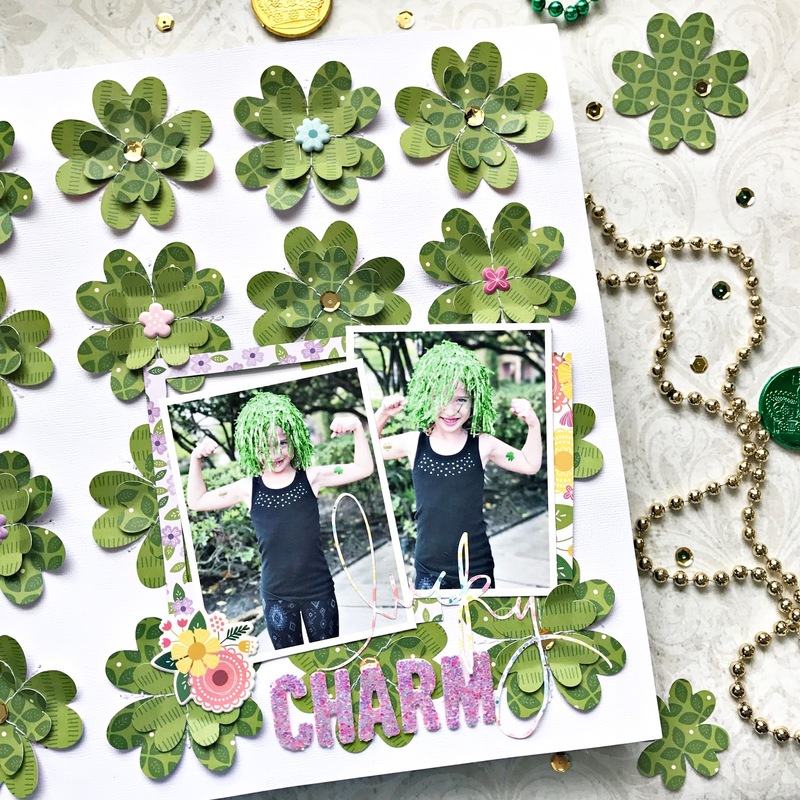 I'm participating in a blog hop with a bunch of talented scrappers and I'm also hosting 2 GIVEAWAYS. 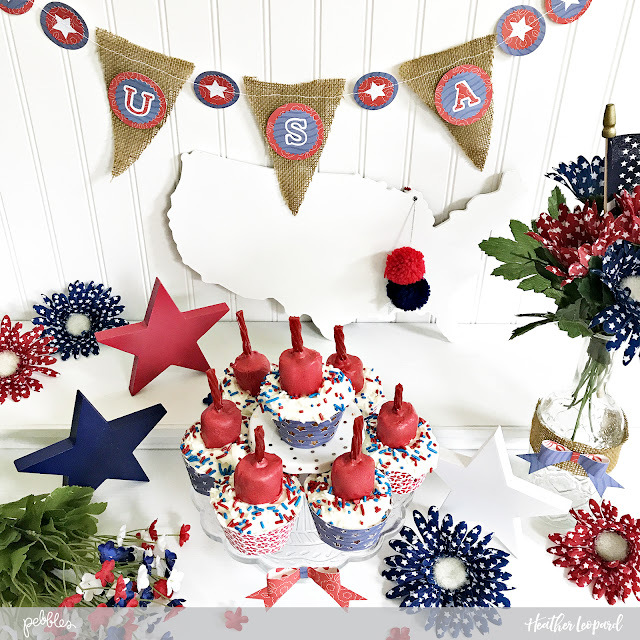 I hope to inspire you with fun ideas from some of my favorite projects from 2017 - from scrapbooking layouts to party planning to home decor and more. 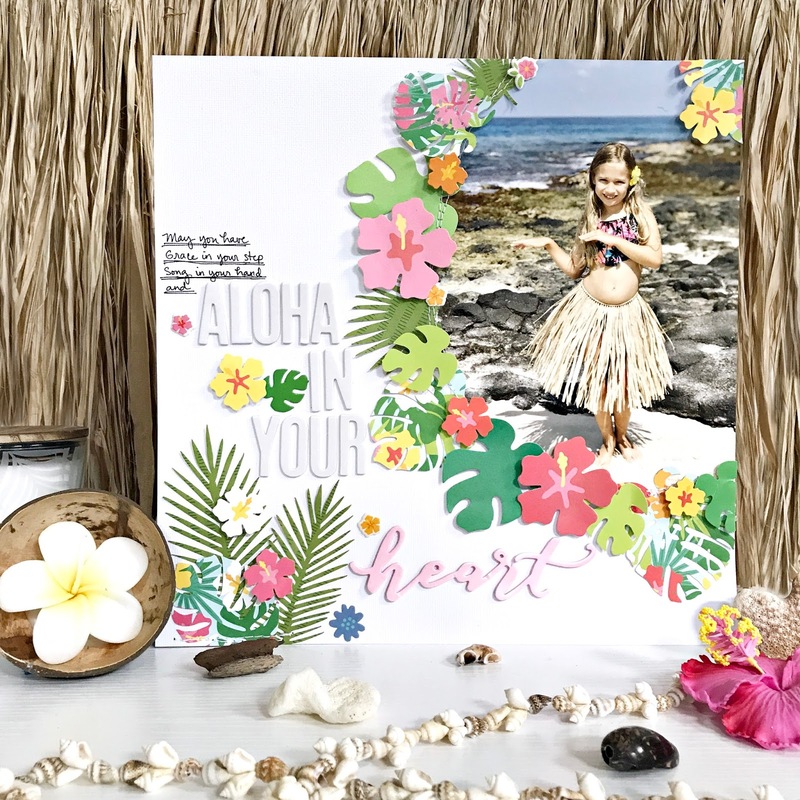 I wanted to use a supersized photo and wanted to create a lei type look. DOWNLOAD the free cut file and view the tutorial HERE. I wanted to celebrate the 4th of July with a bang. The full blog post can be found here. 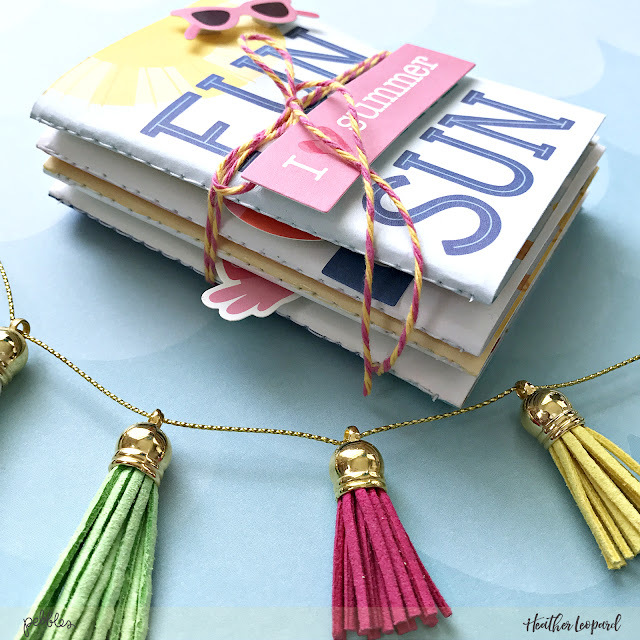 DIY Traveler's Notebook / Mini Album Find out how to make these quick and easy notebooks. 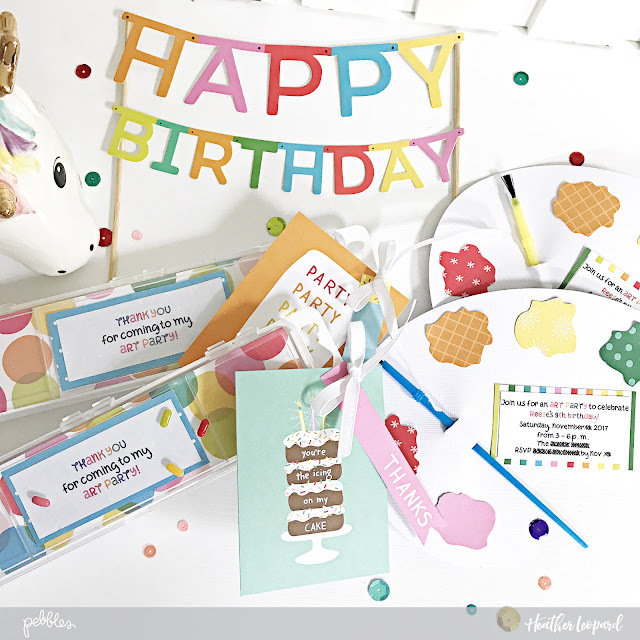 Giveaway: Follow me on Instagram @heatherleopard and leave a comment on the Top Ten Post. Tag a friend in the Instagram post comments for bonus entries - 1 per friend you tag. You have until December 31, 2017 at midnight CST to enter. 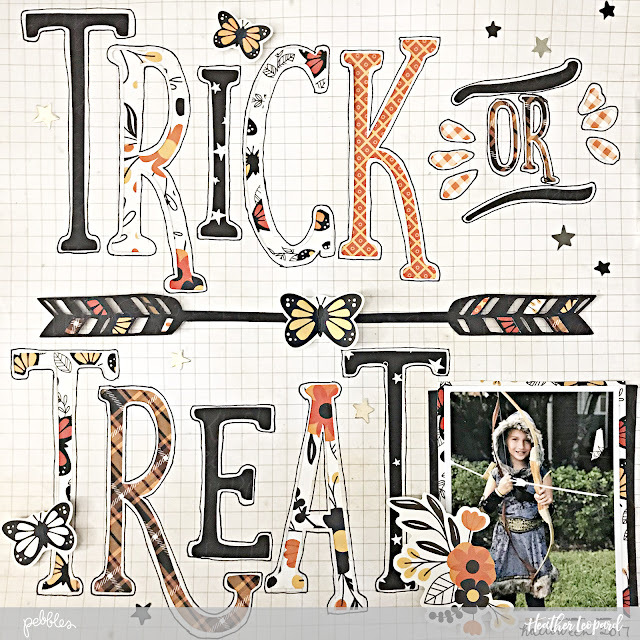 Bonus Entry: Follow me here on my blog and leave a comment on this post. Merry Christmas, y'all! I have to tell you about one of my family's Christmas traditions - train ride to see Santa via the Polar Express in our Christmas pajamas from our house elves. The girls get super excited when they discover these gifts from their elves, who by the way end up covered in tape and wrapping paper. It's so funny and so cute to watch the girls. 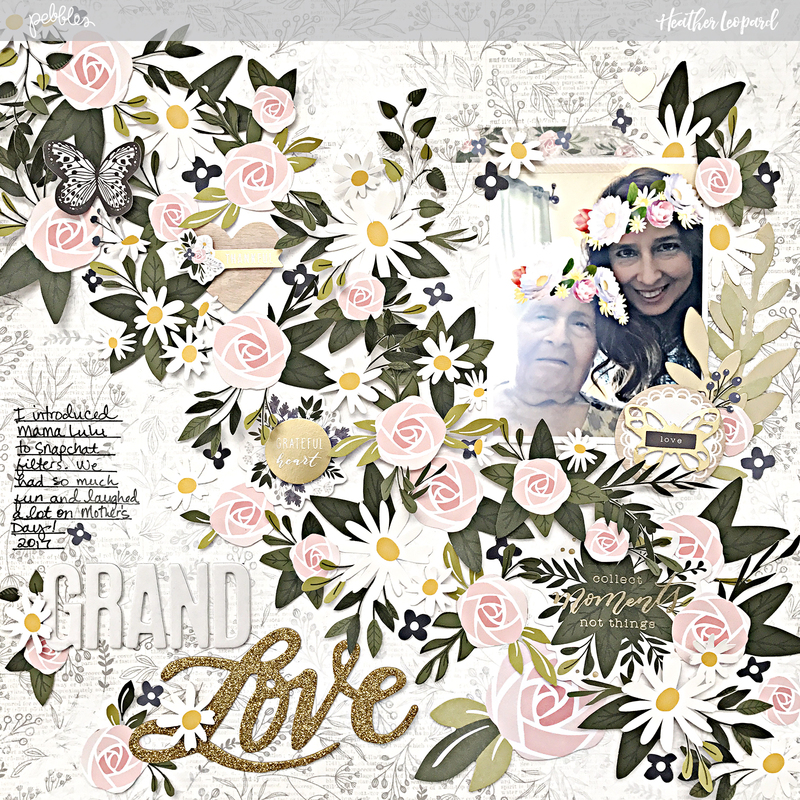 I've documented this story on this scrapbooking layout. We snapped these photos while waiting for the train to take us to the North Pole. The girls even received a golden ticket for the ride. 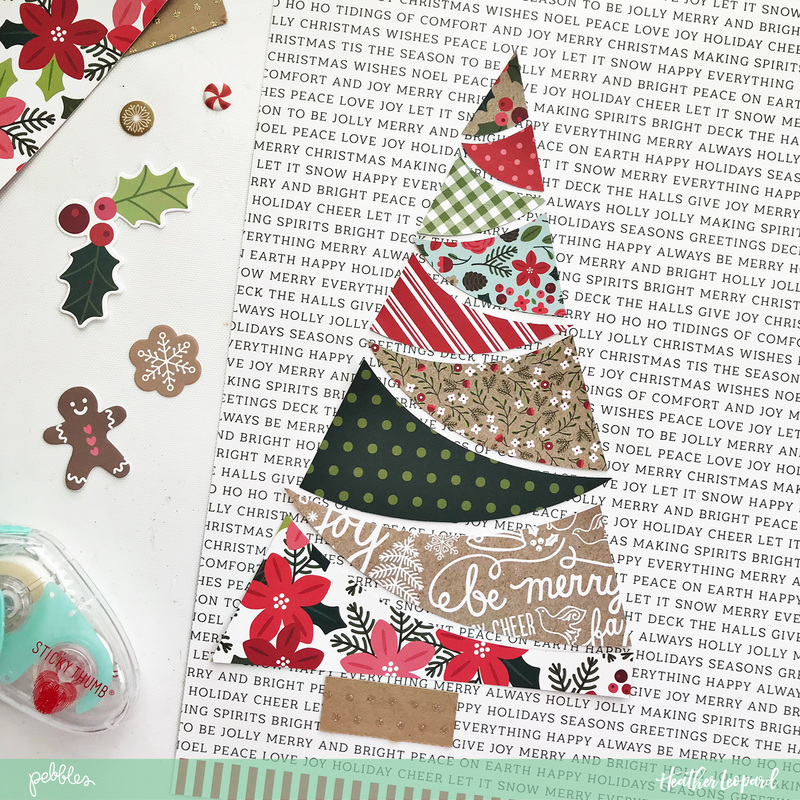 You'll need 5 - 9 patterned papers, scissors or die cut machine, the free cut file I designed, mist or other ink medium, die cuts and other embellishments as listed in supplies below. 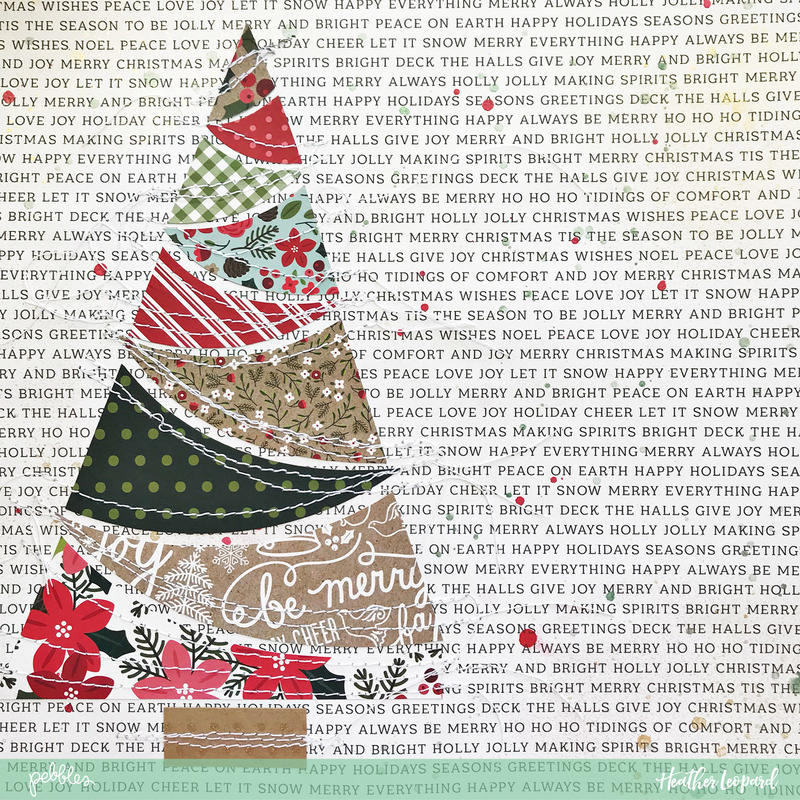 Hand cut the pieces of your Christmas tree or download my free cut file HERE. 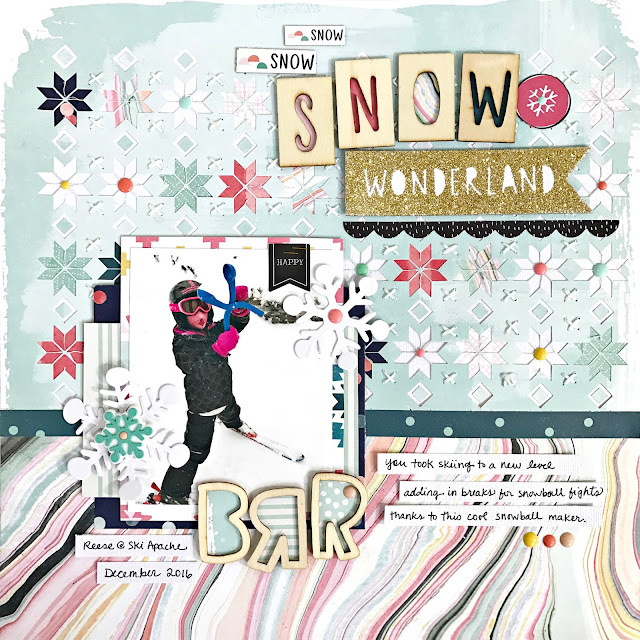 Cut each piece and arrange on the page to make sure you like how it looks. Don't add adhesive yet. You may choose to cut each piece using a different pattern like I did, the same pattern or a repeating pattern. Either way, it will look fantastic. I chose to spread them out with a little space here and there but you might want to place them right next to each other without the space. Next, spray gold mist lightly over your background paper. Once dry, splatter red, green and gold. Let that dry as well. 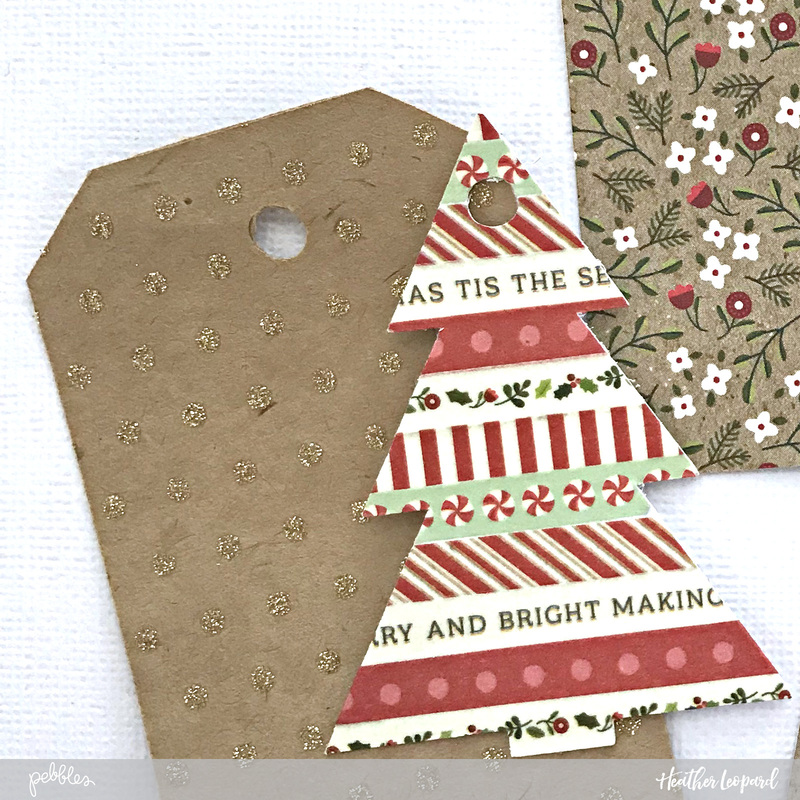 Add your tree pieces back to the page and add some random, creative stitching. Don't worry about perfection. It was designed to have some irregularities. 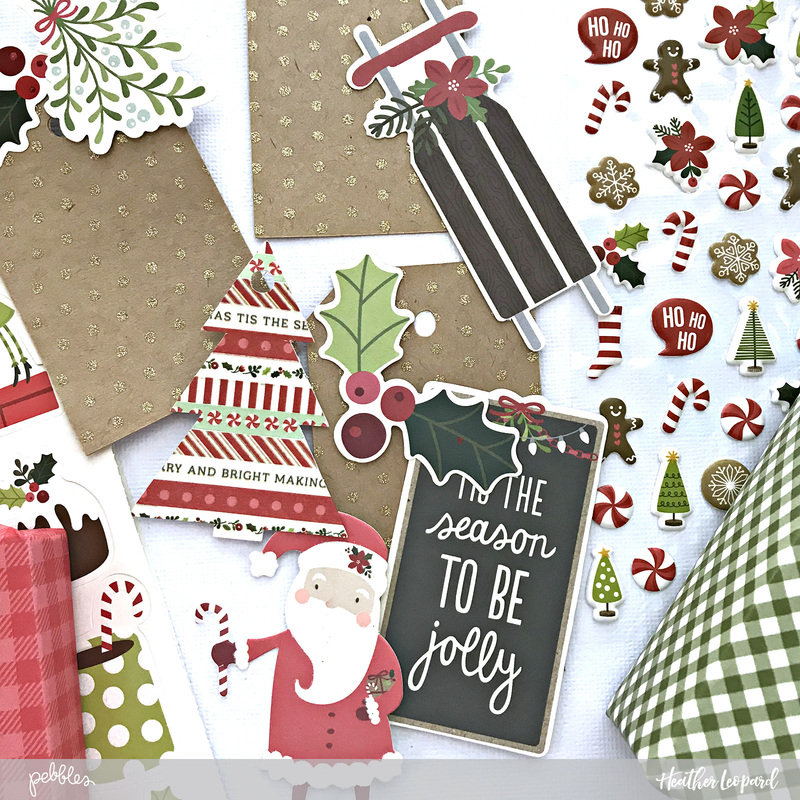 Add some puffy stickers as decorations for your trees to add a bit more dimension. 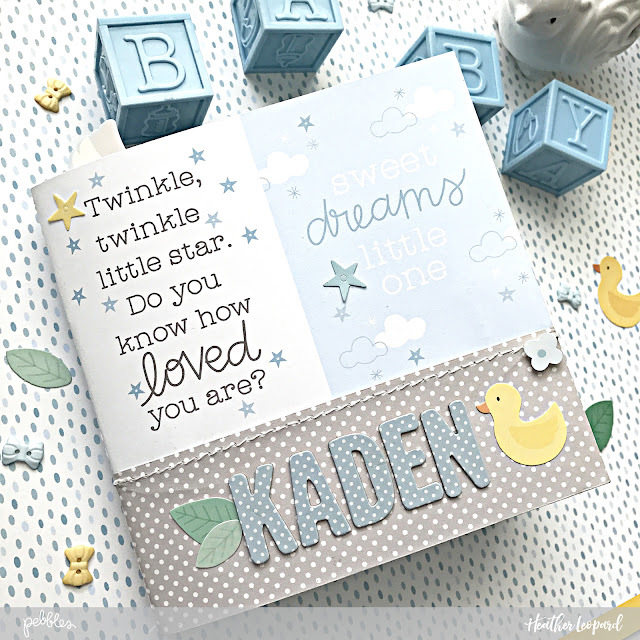 Try to pick out stickers that are the same color as or coordinate with the patterned paper. Add your photos and other embellishments and don't forget your journaling. While I am going to create a complimentary Christmas traditions pocket page with photos of the elves and extensive journaling, I left space at the top of the photos to add journal strips. Thanks for stopping by today. I hope you have a very Merry Christmas! Hi everyone. 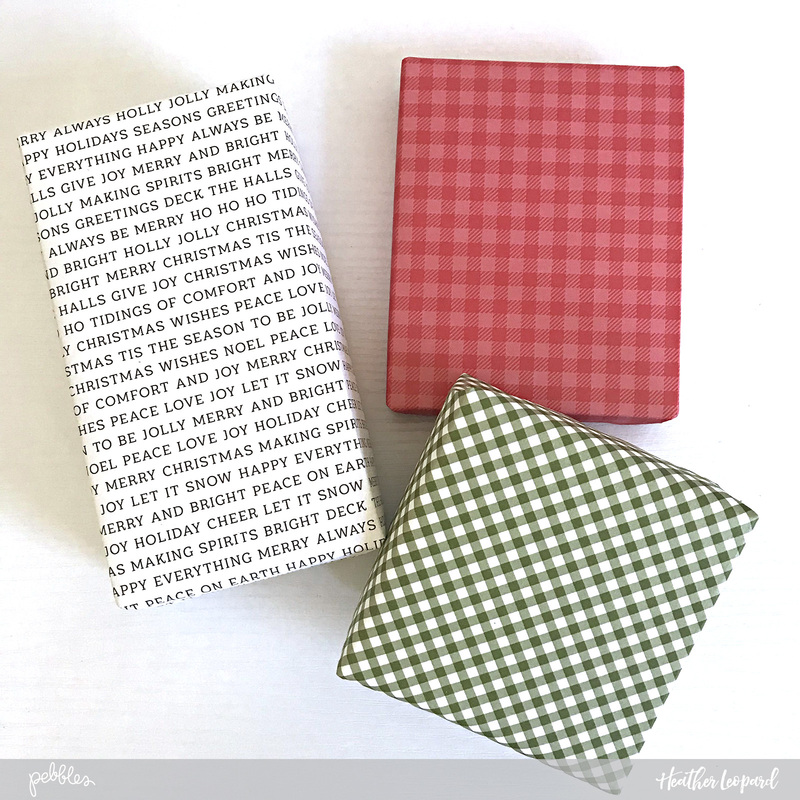 Before I show you my Christmas Gift Wrap Tags, I want to say that I'm thrilled to be returning to the Pebbles design team for a 2nd year. My goal is to inspire you with scrapbooking layouts and all things crafty. Please let me know what you like about me and would like to see more of from me - cut files, types of layouts, more photos, less photos on a layout, etc. etc. Just leave me a comment and/or connect with me on social media, which are all listed at the bottom of this post. 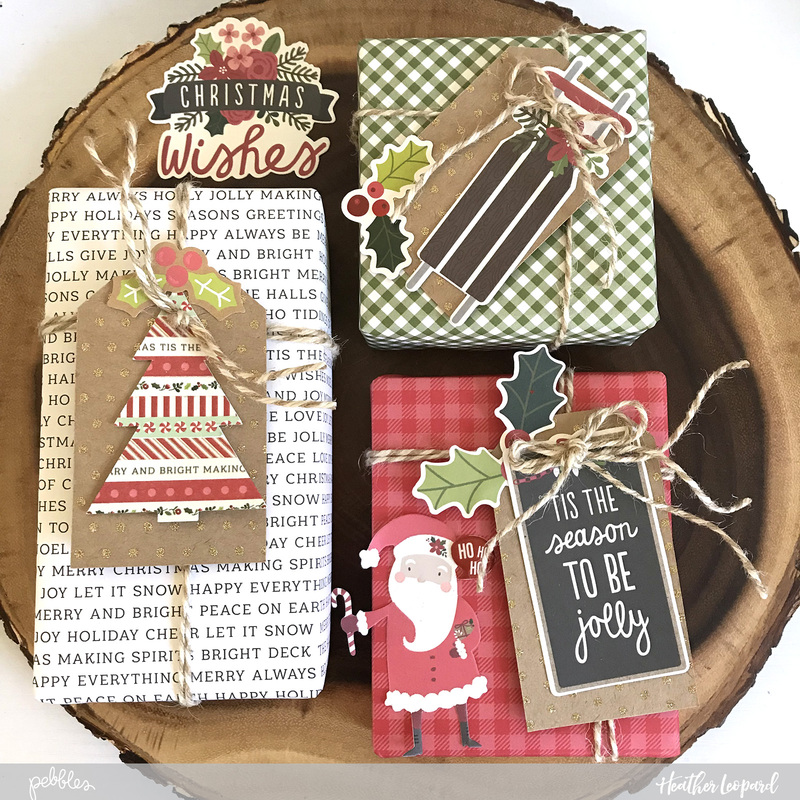 Gather your coordinating tags, die cuts, stickers, twine and anything else you's like to decorate your tags. 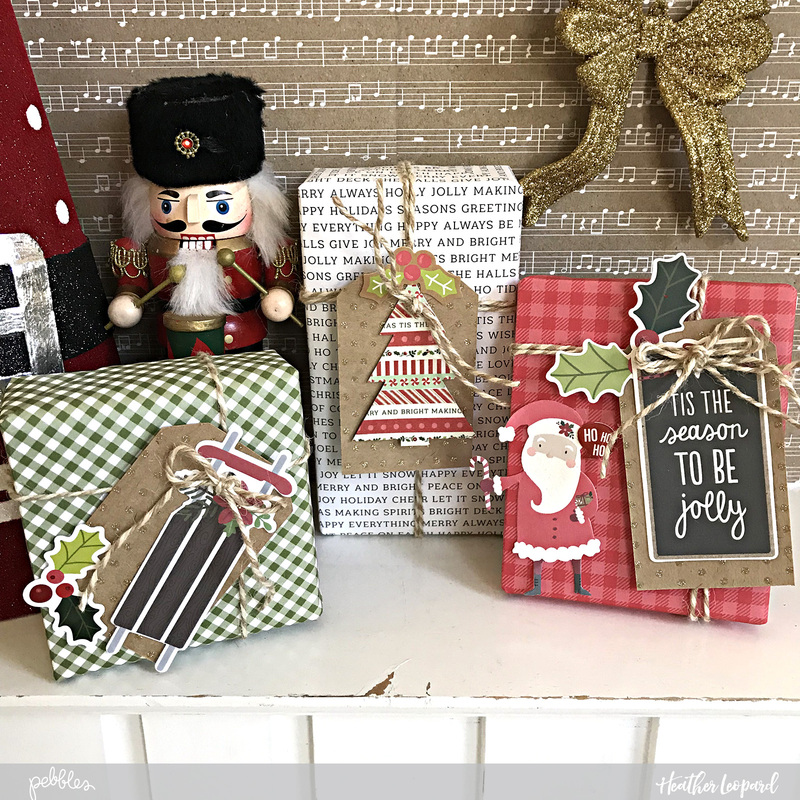 Washi Christmas Tree Tag Add strips of Washi on white cardstock, precut to slightly larger than your Christmas tree design that you will be cutting. 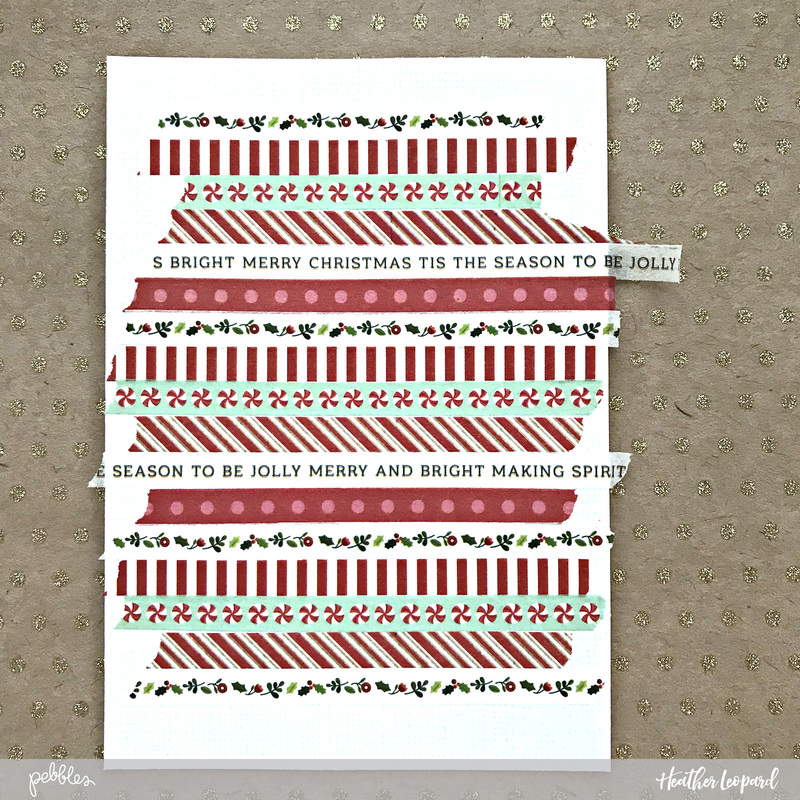 Make sure to add enough rows and cover the majority of the paper. 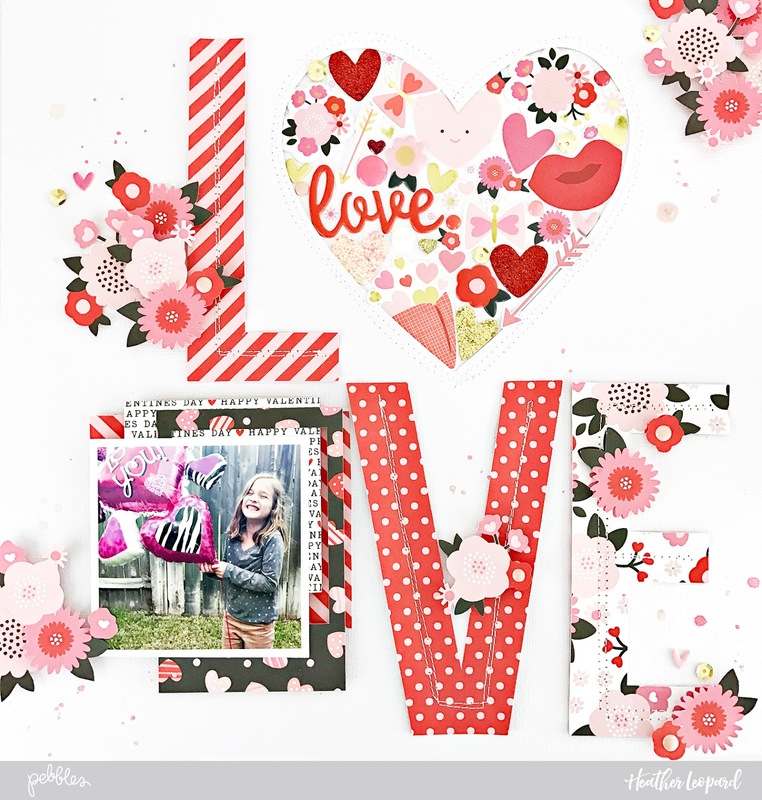 Cut your design using your favorite die cut, machine or by hand. 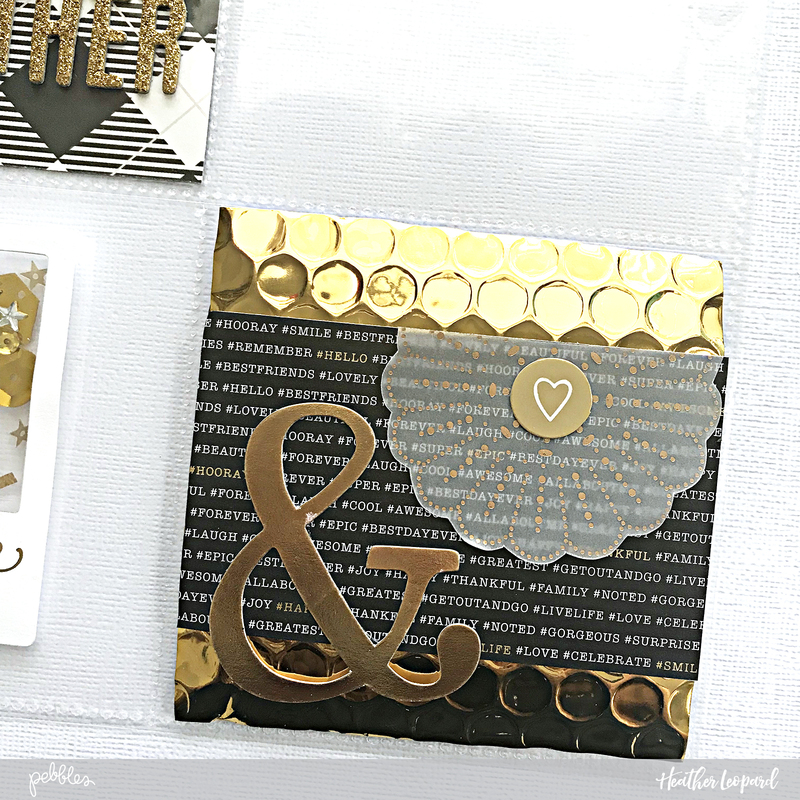 For all tags, layer die cuts and embellishments. Make sure to write a personalized note to the back of the tags. 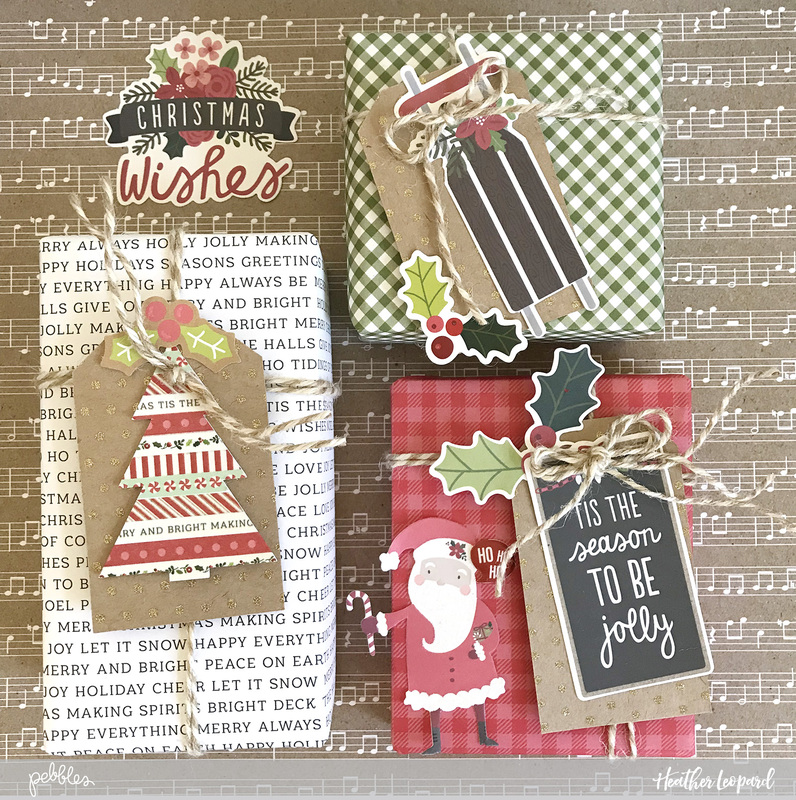 Then, tie twine around the gifts, making sure to tie your gift tags into the twine. Now, you are set! 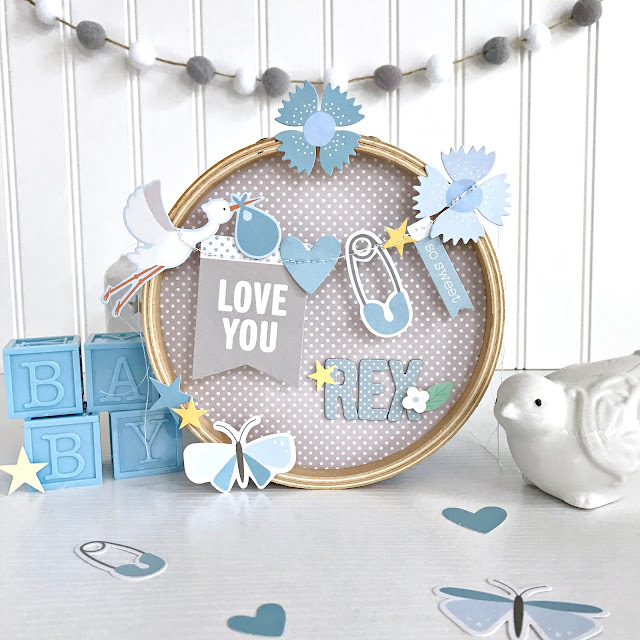 These can be used as part of your home decor until you are ready to gift them to someone special.